*The Roundup is examining the shift in offensive football by going back in time and through the lens of the revolution that occurred here in the state both at the high school and collegiate levels, starting with the dark ages of aerial assaults, the 1960's and moving into the modern era of Air Raids and Spreads. Passing offenses have revolutionized college football that past 20 years and from John Jenkins to Mike Leach to Art Briles, many of the revolutionaries set up camp right here in Texas. On most college football Saturdays the aerial assaults require an air traffic controller. But this wasn’t always the case. For decades college football offenses relied on three yards a cloud of dust, glorious veer and wishbone purveyors coached at almost every school in the country. Rushing the football was king. Passing was a dangerous occupation. We start during the Kennedy administration, a fair place to bookmark given the dynamic shifts that were occurring in college football. In 1958 Army coach Red Blaik implemented a "far flanker" alignment, i.e., moving a flanker to the boundary to force the defense to compensate and place a defender to mirror the flanker. The now-famous "lonesome end" helped Army to an 8-0-1 record and #3 ranking. Rules changes were coming as well, but not yet in place, that made the passing game a more viable offensive weapon. In the college football universe of the 1960's passing was still considered a risky move. 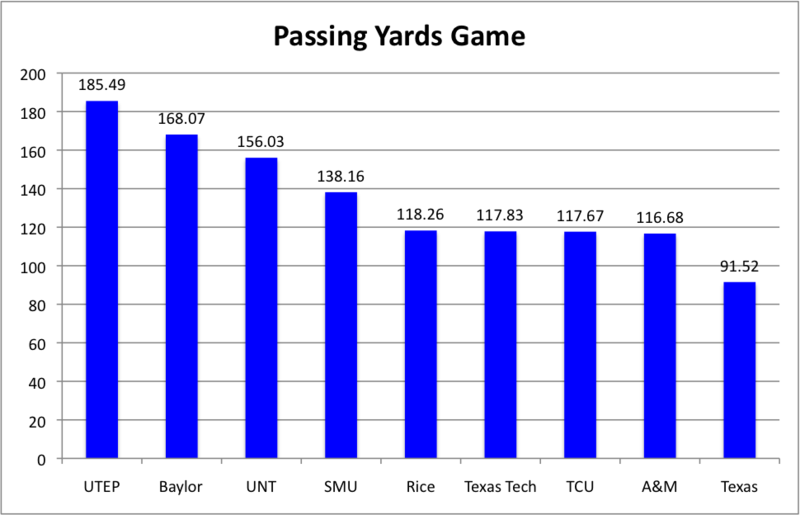 Darrell Royal famously said that passing leads to three possible outcomes and two of those outcomes are bad. Royal held the throne in the 1960's from his home in Austin. His Longhorn teams would win 77 games in the decade, (in an era of 10 game schedules and a rare bowl game appearance) winning two national titles and winning or sharing in five SWC titles. Royal made his living, as did almost all coaches of the era, rushing the football. Royal hired Emery Bellard to install his revolutionary wishbone attack in 1967, and the Horns kept running and winning well into the 80's. Around the state, other teams did mostly the same. The reasons were both obvious and subtle. The passing game revolution in Texas has been spurred by the relatively recent development of 7 on 7 and other passer friendly off-season activities. Improvements in coaching, techniques, and even improvements in equipment, including, turf, gloves, and even the ball, have aided in the offensive explosion. The rules of the game would help as well. Perhaps no rules development had a bigger impact on passing than changes in pass protection. Pass-blocking rules underwent a drastic change in college football during the late 70’s and early 80’s, contributing to the improved and more potent passing attacks. The N.C.A.A. Football Rules Committee began to permit more-effective pass protection in 1977, allowing offensive linemen a ''half-extension'' of the arms. Previously, linemen had to keep their hands against their chest while blocking. In 1980 the rules committee went a step further and permitted full extension of the arms with fists closed, what is called a ''retreat'' block. Then, in 1981, a change allowed a pass blocker with extended arms also to open his hands, thus permitting the lineman to place the palm and fingers against the body of the defender trying to charge the passer. With that context in mind, and jumping back in time to the 60s, offensive linemen were required to keep their hands against their chest during pass protection, and defenders were allowed to used such techniques as head slaps putting an offensive lineman at a greater disadvantage. The numbers reflect the difficulty in protecting the passer as well as the lack of efficiency in the passing game. Today’s quarterback is expected to complete 60% of passes or better. A 60% completion rate has become the efficiency line separating great quarterbacks from inaccurate quarterbacks. During the 60’s and before completion percentages hovered around 50%. Texas for example, in spite of two national titles, never had a passer complete more than 49% of passes during the decade. Worth noting, the Longhorns averaged more than 100 yards passing per game only three times in the decade. But the way the Longhorns ran the ball and the way they played defense, any form of a passing game was gravy. Passing yards per game from 1960-69. There were outliers, of course, Baylor under John Bridgers routinely averaged 25 or more attempts through the air, a very high number for the time. Bridgers brought what was at the time, a wide open, pro-style passing attack to Waco when he arrived in 1959. The Bears made three bowls games under Bridgers during the decade, including finishing as runner-up to Texas in 1963. That season Oklahoma City native Don Trull threw for 2,157 yards and finished fourth in Heisman voting. Bridgers, who helped mentor Unitas who went on to become one of the best quarterbacks in NFL history, installed the Baltimore Colts' offense and found a heady pupil in Trull. As a high school player Trull played in a spread-style shotgun offense, throwing for 24 touchdown passes in 10 games as a high school senior. “We were an anomaly because we passed the ball all the time,” Trull said. “We weren’t real big, but we had some receivers and halfbacks who could catch. Trull fit right into Bridgers pro-style passing scheme. Trull also credited Baylor assistant coach Charles Purvis for helping him become a more skilled passer. "That summer (1960), I stayed there and worked out at Rena Marrs McLean Gymnasium five days a week in the evening, throwing the football," he said. "Coach Purvis was there working on his master's and worked with me on the art of throwing the football." Trull twice led the nation in passing and threw for more than 4,000 yards and 27 touchdowns in his Baylor career. Trull's yardage record stood at Baylor for almost 25 years. During the 1963 season, the Bears would fall to mighty Texas 7-0 in Austin, their only conference loss. The Horns would go on to win the National Title, beating Roger Staubach and Navy in the Cotton Bowl. The loss to Texas continues to haunt Trull, who overthrew a wide-open James Ingram in the end zone at one point and had another pass intercepted in the end zone as time wound down at the end of the game. "If you look at the film, we moved the ball up and down the field" Trull would say in 2013. "You remember the ones the most that hurt the most, which are the ones you lost." Terry Southall would succeed Trull and rank in the top 10 in the nation in passing attempts, completions, and yards in 1964 and 1966. Outside of the Southwest Conference UTEP and North Texas, both averaged greater than 26 attempts per game for the decade and while both strung several good seasons together, neither passing attack had much-staying power. UTEP's Billy Stevens would throw for over 6,600 yards in three seasons in El Paso along with 52 touchdowns. North Texas' Steve Ramsey ended his career after throwing for 7,076 yards and an astonishing 69 touchdowns and an equally astonishing 67 interceptions. Ramsey's touchdown record stood for 15 years before Doug Flutie broke it. Ramsey and Stevens are tied for 7th in NCAA history with 67 passes intercepted. Passing attempts per game 1960-69. If any program was a precursor of what was to come it was SMU in the late 60’s early 70’s, Hayden Fry became a legend at Iowa in the late 70’s, but he cut his teeth at SMU and North Texas. Fry ran a more conventional, conservative offense before his first few seasons on the Hilltop. That changed when Fry recruited a 6-2 quarterback perceived to be too slow to run the option and to skittish to survive long in any system, his name was Chuck Hixson, and after sitting out in 1967, Fry molded a high flying offense around his young quarterback. To get over his skittishness, SMU coaches would form a line just beyond the pocket and prevent Hixson from retreating beyond that point once the heat came. Hixson settled in as a comfortable pocket passer who could make a wide variety of throws. Fry and a young SID coined the term “Excitement 68' ” to commemorate the new direction of the program, and after upsetting Auburn in his first start, Hixson, Fry, and the Mustangs were on their way. Fry set Hixson loose and as evidenced by the Auburn win in which Hixson threw 49 times. The Mustangs were going to make their living through the air. To prove the point, a week late at Ohio State Hixson threw 69 times in a 21 point loss to the Buckeyes. Fry’s offensive philosophy was simple, "Everything we do is based on one theory, we believe it's easier to throw for four yards than to run for four. At least with Chuck it is." The Mustangs would lose three games in 1968, each to top 15 ranked teams, even taking one loss Arkansas to the wire on the road. Hixson’s favorite target was the man who helped integrate the Southwest Conference, Jerry Levias. Levias caught eighty passes from Hixson in 1968, concluding his career 14th in SWC history, the only player from the era other than Baylor’s Lawrence Elkins to crack the top 20. Hixson led the Mustangs to a Bluebonnet Bowl win over Oklahoma. Hixson would never again put up the numbers from his 1968 season. In '68 Hixson attempted 468 passes, hitting on 56% of the attempts, for 3,103 yards with 21 passing touchdowns and 26 touchdowns total. Though his numbers declined, Hixson still led the conference and was top 10 in the country in almost every passing category for the next two years. Part of the decline was the graduation of Levias. Over the next two seasons, no SMU receiver would catch more than 52 passes. To begin the 1969 campaign, Hixson was the focus of a Dan Jenkins' SI piece on the aerial circus that Hixson and Fry and introduced to the country. Chuck Hixson, too slow to run the option, fast enough to set records. Hixson set the SWC conference on fire, leading the league in completions, attempts, and yards for three consecutive seasons. Fry believed that Hixson was the greatest passer to play the game and though the Mustangs never replicated their 1968 success, Hixson would end his career holding almost every national and conference passing record, throwing for 7,179 yards in over 1,100 attempts. When the Conference folded in 1995, Hixson was ranked third all-time in completions and attempts and fourth in completion percentage. Hixson stands out at the only player from the era to make the top 15 in any passing categories. His 641 career completions record stood for a decade. Still, an efficiency issue lingered. Hixson for all his trailblazing numbers ended his career with 56 interceptions compared to 40 touchdowns. Ramsey and Stevens never completed more than 50% of their passes in any season. Defenses also caught on and adjusted and the revolution staggered. More importantly, the mindset that passing was a dangerous endeavor continued to control. After Hixson's graduation, Fry returned to his run-based offense, featuring two time thousand yard rusher Alvin Maxson. After a decade at Baylor John Bridgers was let go and his progressive offense went with him. The wishbone became the offense of choice with Alabama, Oklahoma, Texas, and others perfecting the run-based attack and using it to win National Title after National Title. What Hixson, Fry, Bridgers, Tull and the rest of the early gun slingers accomplished wouldn’t be replicated until a fast-talking former USFL offensive coordinator showed up at the University of Houston. Posted on February 9, 2016 by The Roundup and filed under Southwest Round-Up and tagged North Texas Chuck Hixson Passing Game Revolution Don Trull Hayden Fry John Bridgers Darrell Royal UTEP SMU Baylor Charles Purvis Roger Staubach James Ingram Terry Southall Billy Stevens Steve Ramsey Jerry Levias Lawrence Elkins Alvin Maxson.